Or is It All Lives? Everyone knows that all lives matter, but the question is do they matter equally? 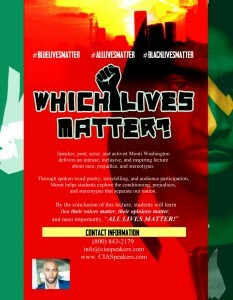 “WHICH LIVES MATTER” is an intense, inclusive, educational program, intended to build bridges, not walls. Speaker, poet, and activist Monti Washington helps students explore the history, conditioning, stereotypes, and racism that separates and divides our community and nation. He addresses the issues from a social media and social justice perspective. With spoken word poetry, personal stories, and social media examples, students will learn how they can make a difference on their campus and in their community. By the conclusion of this lecture, students will see that their voices matter, their opinions matter, and most importantly, that “ALL THEIR LIVES MATTER”. Monti’s passion for helping students stems from the adversity he faced early on in life. Forced to live in poverty due to his mother’s drug addiction, Monti grew up sleeping on cardboard boxes, living in parks, and being abused by foster parent after foster parent. Until 8th grade Monti was in special Ed. classes and was held back on two separate occasions. Despite this adversity, Monti went on to obtain two college degrees, become a state basketball champion, award winning poet, Mcdonalds All- American nominee, nationally recognized actor, and co-founder of Truality.org, a non-profit organization aimed at inspiring youth to be TRU The Real U.
Monti put on a wonderful program and the students at Illinois College really enjoyed his message. Monti really did well with making everyone feel included even though we had a big crowd for the performance. Monti’s message was one that was greatly needed on our campus and I think the students learned a lot.